Members of the “Save No. 16 Moore Street” committee and their conservation architects met with Heritage Minister Jimmy Deenihan and Members of the All-party Oireachtas Consultative Group on Centenary Commemorations at Moore St yesterday afternoon to review progress with the commemoration project to date. The Minister and his Group were briefed on how the buildings had been saved, from a position of full permission from the City Council and An Bord Pleanala for their demolition in 1999 to the present situation where No. 16 and its contextual buildings had been saved and guaranteed complete reinstatement to their pristine 1916 specification, to be completed in good time for the 2016 Easter Rising centenary commemorations. The Minister was told that the “Save No. 16 Moore Street Committee” had originally campaigned to save only No. 16 itself, the last HQ of the provisional government where the surrender decision was made, but that this had been extended to cover the terrace of not only No. 16, but its contextual buildings as well. This was to implement the recommendations of the leading firm of conservation architects which had been initially engaged by Dublin City Council, at the behest of the “Save No. 16 Moore Street Committee”. 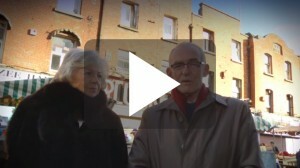 The terms of reference which had been given to the conservation architects was to carry out a minutely detailed historical/heritage survey of the Moore Street area and bring in recommendations as to how the proper balance should be struck between, on the one hand, appropriately commemorating the events around the genesis of our State, which unfolded in Moore Street in the latter days of Easter week 1916, while on the other hand giving due regard to the necessity to regenerate the northern environs of our capital city’s main thoroughfare, which has fallen into a sorry state. So impressed were the 52 Members of Dublin City Council with the report/recommendations which were delivered by the conservation architects that they voted unanimously that the report should be made into a history textbook and distributed to every secondary school in Ireland. The proposed plans for the commemoration and regeneration were prepared by the owners of the properties and Dublin City Council planning staff and the fruits of these endeavours were subjected to further robust examination and improvement by An Bord Pleanala, to arrive at a comprehensive Commemorative/Regenerative package which has been titled “Dublin Central”. The “Save No. 16 Moore Street Committee” endorsed this product of the efforts of the Dublin City Council Planning Department and An Bord Pleanala and is anxious that the Commemorative/Regenerative concept is brought to fruition in good time for the centenary celebrations in 2016.